Mrs Newman of 9 St Mary Street Chippenham on Friday received from the War Office intelligence that her husband Pte AG Newman of 7th Gloucs had been killed 8th August 1915 whilst serving at the Dardanelles. Mrs Newman also has a son in the same regiment serving in the Dardanelles who has been wounded. 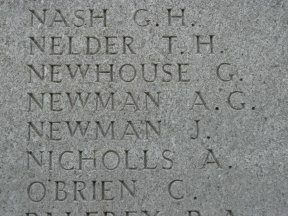 Newman had been a teacher at Lowden School and left to join the Army at the outbreak of the war. The 1911 shows Newman as a Masons Labourer. Mrs Newman's son who was wounded was Sydney Bowen who lost both legs.